Posted by Cora Hall on January 16, 2019 in Hockey, Sports. After falling twice to Minnesota State University–Mankato in November, the Bulldogs looked to avenge themselves in their first home series of 2019, but came up short with two losses on the weekend. The Bulldogs hoped to change their luck with a change in goal, and Ferris junior goaltender Justin Kapelmaster started in net both games for the first time since a tie Friday, Dec. 7, against Bowling Green State University (Ohio). The Mavericks, ranked No. 8 nationally, held a record of 16-5-1 heading into the weekend of Jan. 11 and 12, with 11 wins in Western Collegiate Hockey Association (WCHA) play compared to Ferris’ three conference wins. The Bulldogs fared much better this weekend in defensive play, giving up five goals compared to the 12 they allowed when they last faced the Mavericks in Minnesota. Friday, Jan. 11, was a slow start for the Bulldogs and they fell behind 2-0 in the rst period. The Mavericks’ rst and second goals came from Mankato soph- omore forwards Reggie Lutz and Jake Jaremko 12 minutes in, with Jaremko’s goal off of a power play that the Bulldogs could not answer to in the rst period. Six minutes into the second period, the Bulldogs rallied with a goal by Ferris senior defenseman Zach Tierney, his second of the season. He was assisted by Ferris freshmen forwards Hunter Wendt and Jake Transit. 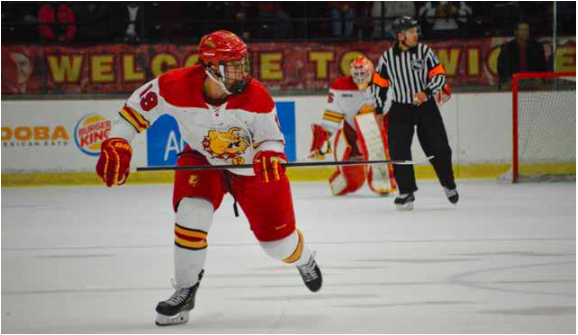 The Bulldogs would even the game in the third period with a goal by Ferris sophomore forward Lucas Finner, who tapped in a deflected shot by Ferris freshman defenseman Cooper Zech. Despite their efforts in the third to seal the deal, Ferris would enter overtime for the third game in a row. The Bulldogs would create two quality chances on goal but the Mavericks would take the game with a goal by Mankato junior defenseman Ian Scheid in at 3:03 of extra time. At the end of the game, Minnesota State outshot Ferris 41-19 and Kapelmaster had 38 saves in the goal. Daniels said he was happy with Kapelmaster’s performance in goal after not seeing the ice for awhile. Saturday, Jan. 12, would be another slow start on both sides of the ice, as there were no goals scored in the first period. Kapelmaster got the start in net again and stayed perfect through the first, facing 16 shots in the first period as the Mavericks continued to lead in shots, with Ferris getting only six off. Minnesota State struck first with a controversial goal call two minutes into the second period by Mankato sophomore forward Dallas Gerads. The officials reviewed the play for kicking, but ultimately called it a goal for the Mavericks, deciding that Gerads kicked the puck and deflected it in with his stick. Ferris nearly scored off a power play halfway through the second but failed to match the Maverick goal in the second period, despite gaining five power plays. Minnesota led Ferris in shots at the end of the second 31-16. The Mavericks increased their lead in the third with a goal from Lutz to make the score 2-0. Ferris finally got on the board on a power play with less than five minutes left in the game and Ferris junior defenseman Nate Kallen would get his fifth goal of the season, assisted by Ferris senior forward Corey Mackin and Zech. The Bulldogs would get off five more shots and even pull Kapelmaster out of the net in a last attempt to tie up the game, but they ultimately fell short 2-1. Kapelmaster put on another strong performance for the Bulldogs with 42 saves and Kallen had the lone goal of the night. The Bulldogs will take the ice again 7:37 p.m. Friday, Jan. 25, and 7:07 p.m. Saturday, Jan. 26, at Bowling Green State University.